2. In a food processor, pulse bread in small amounts (1 c. at a time) to make large, flaky breadcrumbs. 3. In a large mixing bowl, combine breadcrumbs with evoo, chopped garlic, salt, pepper, cheese, and parsley. 4. Stuff peppers with breading mixture and place in a large baking dish. 5. 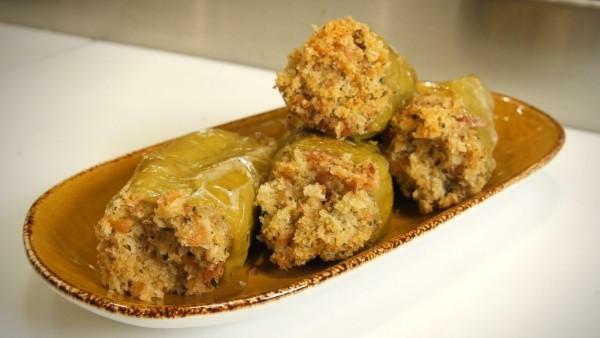 Drizzle with some extra virgin olive oil and sprinkle with salt; cover with aluminum foil. 6. Bake for 45 minutes or until peppers are soft. 7. Remove foil for the last 5 minutes to get a brown crust.